• What is food security? • What is Buffer stock? • What is the Public Distribution System? → Government action at times, when this security is threatened. • Food is as essential as air. Food security means availability of food to all, and available food is accessible to all and accessible food is affordable to all people at all times. → Here, food availability refers to availability of food in countries. → Accessibility of food means food is within people’s reach. → Affordability for food refers to people are able to buy it. → Creation of “Buffer stock” is also done in this system. • Food security is helpful at the time of natural disaster when there is lack of food. → At the time of natural disaster like earthquake, flood, or drought etc., production of foodgrains decreased which creates a situation of decrease in food availability. → The attainment of food security therefore involves eliminating current hunger and reducing the risks of future hunger. → Famine of Bengal in 1943 was the most devastating famine. → In rural areas, landless and small farmers, traditional artisans like blacksmith, providers of services like washermen, petty self-employed workers and destitute are came under the category of food-insecure. → In urban areas, persons who employed in ill-paid occupations and casual labourers are food insecure, these labour came under seasonal workers and have low wages. → Children under the age of 5 years, large proportion of pregnant and nurshing mothers are also came under the category of food-insecure. → Person who is not able to fulfil their daily requirements or people came below poverty line are also food-insecure. → People belonging to some scheduled castes and OBC are also came under the head of food insecure. → In India, some states has large number of food-insecure like, Bihar, Orissa, Uttar Pradesh, Jharkhand, West Bengal, Chhattisgarh, parts of Madhya Pradesh and Maharasthra. • When a person is unable to get work for entire year, then they came under the category of seasonal hunger. seasonal nature of agricultural activities and in urban areas because of the casual labour that is there is less work for casual construction labour during the rainy season. • This type of hunger exists when a person is unable to get work for the entire year. • Chronic hunger is a consequence of diets persistently inadequate in terms of quantity and/or quality. • A person who has low level of income is came under the category of chronic hunger. 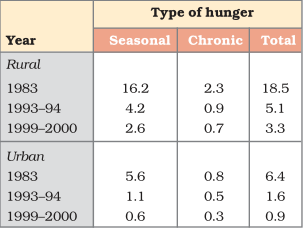 → This table shows different year production of foodgrains in India. → During the period of 1965-1995 production of wheat increased by more than four times in the state of Punjab and Harayana. → Because of availability of sufficient foodgrains the government of India introduce food security system like, Public Distribution System, buffer stock. → The farmers Sale theirs foodgrains at minimum supply price i.e. pre-announced price of the government. → This foodgrains stored in the warehouse of “Food Corporation of India”. This stock of foodgrains is called Buffer stock. What is the Public Distribution System? • Public Distribution System (PDS) is the system of providing foodgrains from Food Corporation of India to the poor section of the society at subsidized rate. • This programme was launched in 1992 in 1,700 backward blocks in the country. This is a food security programme. • For the implementation of this system many programmes are launched by the government of India like the Antyodaya Ann Yojana which is for poorest of the poor and the Annapurna schemes which is for needy senior citizens. These two programmes are launched in 2000. (iii) APL card for other all people. • About 5.5 lakh ration shops or fair price shops are here all over the Country for implementation of this system. • At the time of introducing of Public Distribution system, it was for all category of people i.e there was no discrimination between the poor and non poor. • In 1992, Government of India decided to launch Revamped Public Distribution System (RPDS) in 1992 with the aim to start it in 1,700 blocks in the country. • Again in 1997, Public Distribution System revised as Targeted Public Distribution System (TPDS) which was only for the poor section of the society. → It helps to keep food price stable by providing food at concessional rate. → It helps to prevent large number of hunger and the famine by the way of supplying food from surplus region to deficit ones. → Public Distribution System is purchased foodgrains from Food Corporation of India and created buffer stock. → Poor section of the society can easily buy food at subsidized rates from fair price shop and it has been possible through Public Distribution System. → It assuring to the farmers by the way of purchasing food at minimum sport price. → In this system foodgrains are stored as buffer stock which became wasteful due to gradually decrease in the quantity of foodgrains due to deterioration, wear and tear, and rotting etc. → Sometimes products of the Public Distribution System is malpracticed by the PDS dealers through selling the foodgrains in the open marked for getting better margin. • Cooperative opens many fair price shops to sell foodgrains at concessional rate. • Academy of Development Science is an organization of training and capacity building programmes on food security for NGOs in Maharashtra. It facilitates a network of NGO for setting up bank of grains. It is a successful food security intervention. • In Tamil Naidu, 94 per cent fair price shop are being run by the cooperatives. • Mother Dairy is a success story of cooperatives in milk and vagetables in Delhi. • Amul is also a success story of cooperatives in milk and milk products in Gujarat. • This programme was started on November 14, 2004 in 150 most backward districts of the country. • The programme is for those rural people who are needy of wage employment and desire to do manual unskilled work. • The aim of this programme is to intensify the generation of supplementary wage employment. • It is 100 per cent centrally sponsored scheme. In this programme, the foodgrains are provided to States free of cost. • At district level nodal officer is the collector in this programme. • This yojana was started in December 2000. • One crore of the poorest among the BPL families are came under Public Distribution System in this programme. • In this programme, poorest people were identified through Below Poverty Line survey. • Now, 2 crore families have been covered under the AAY with the increment of 50 lakh each in June 2003 and in August 2004. • It is a form of financial aid made by the government to a producer to fix the price of a commodity. • It leads to a fall in price of subsidized product with maintaining producer’s profit.